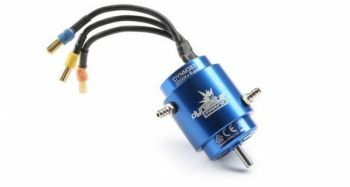 Dynamite 2000kv marine motor. This is a high quality motor that can be used in many different applications. Includes an installed cnc water jacket for optimal cooling.This motor can be used with 4s to 6s lipo packs in a 30" of less hull. It will generate 3/4-1hp. Motor mount with 25mm hole spacing. This is a quality motor. Runs better than any other 36mm stock motor I have run. Very tolerant of abuse! Great on 4S, outstanding on 6S! Runs best for me at zero timing. Gets hot very quickly at anything else.